I am a grade 2 elementary school teacher from Vancouver, Canada. For one year I have had the opportunity to trade homes and jobs with another teacher. I now live and teach in Sydney, Australia. 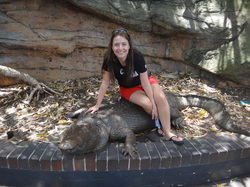 I have made this site so my class back home in Canada can learn all about what life in the land Down Under is all about! And what they are most excited about... the creatures! It will be mostly pictures and short stories for the children to enjoy on their own or share with their parents.